Rolls Royce Phantom Limo is the car for the special occasion, this is the car all the stars and celebrities like to be seen in. Rolls Royce have always been known for building quality vehicles. 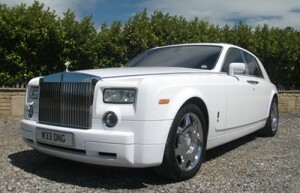 The latest addition to the Rolls Royce family is known as the Rolls Royce Phantom. The huge presence the vehicle has whether moving or stood can be compared to no other. The Flying Lady, which stands elegantly on this huge chrome grill, dominates the front giving the Limo a unique feature. ACE STAR Limousines Hire have many years expeience of providing chauffer driven Phantom Limousines in white, silver and black throughout Yorkshire. If your are looking to hire a new Rolls Royce Phantom in white, Rolls Royce Phantom in silver or Rolls Royce Phantom in black then look no further. A White Wedding Car is traditionally considered the best classic colour to choose for your wedding day but a Silver Rolls Royce Phantom can also be stunning. Whatever colour you choose, a Rolls Royce Phantom Wedding Car is guaranteed to make a lasting impression and provide a memorable experience to be remembered for many years to come.